Running contests in social media can get pretty sticky. Each social network has its own contest-related rules to comply with, and let's just say many of them aren't exactly easy going. If you've ever tried to host one on Facebook, you know exactly what I'm talking about. A lot less strict than Facebook's official contest guidelines, eh? In fact, in traditional Pinterest fashion, they're even a bit confusing and vague -- that second point about sweepstakes, namely. 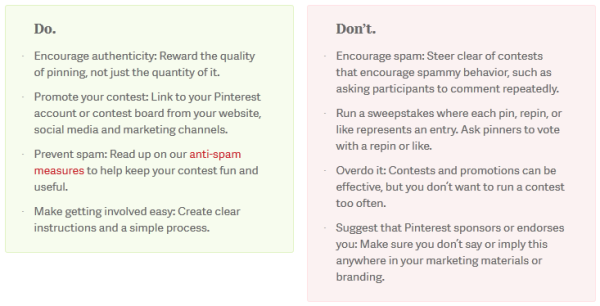 Our best understanding of this particular "don't" is that Pinterest is discouraging sweepstakes-like contests where the winner is decided by a randomized selection from the pool of entrants, likely as a way to limit spammy pinning behavior. Instead, Pinterest seems to be encouraging a vote-based structure for choosing winners. Pinterest's fairly laid back attitude isn't the only benefit of using the platform for contests. Contests on Pinterests also tend to generate a lot of engagement, because they organically tap into the nature of general Pinterest use, especially when they're done well. So if you're considering trying out a Pinterest contest of your own, here are 8 examples of Pinterest contest held by real brands to inspire you -- and why they work. Go ahead. Experiment with one yourself. 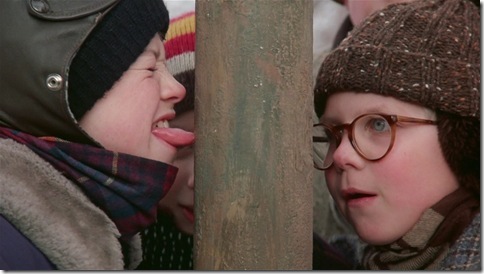 We triple dog dare you. Back in February, Country Living launched its "Dream Bedroom Pinterest Contest," which asked pinners to follow the Country Living Pinterest page, launch a new Pinterest board entitled "My Country Living Dream Bedroom," and pin at least 10 items that represent their dream bedroom (5 of which needed to be pinned from CountryLiving.com), all tagged with #countryliving and #dreambedroom. To submit their entry, pinners were required to comment on the contest's pin with a link to their pinboard. Entries were then judged by a panel of Country Living editors based on criteria including originality, creativity, adherence to the rules, and "a general sense of the Country Living aesthetic." The winner was rewarded with a bedding set from Garnet Hill. What we love about this particular contest is that the pinboard Country Living asked participants to create (their idea of their dream bedroom) is one they'd probably like to create regardless. Sure, you may have to pin 5 things from the Country Living website, but if you found out about this contest because you're already a fan of Country Living -- which is more than likely -- you probably would've pinned things from its site anyway. And there's no stopping you from pinning way more than the 10 items Country Living requires. In this way, Country Living expands its reach but doesn't stifle engagement by requiring too many brand-related pins. Country Living also adheres to Pinterest's guidelines against sweepstakes by involving a panel of judges to determine the winner rather than randomized selection, even though those guidelines weren't even in place at the time Country Living launched the contest. For example, GE ran a contest on Instagram using the hashtag #geinspiredme. After the contest, they featured the top photos as a board on their Pinterest account. In November 2011, GE launched a contest, "The Next GE Instagrapher," aimed at finding GE's next photographer to capture and share the research and technology GE is known for developing. Entrants were asked to take photos inspired by or reflective of one of GE’s four areas of innovation -- moving, building, curing, or powering -- and to share their photos on Instagram using the hashtag #GEinspiredME. Entrants' photos were then featured in a gallery on the GE Facebook Page, where users could vote. The finalists were evaluated by a panel of judges, and the winner was given a free trip to the United Kingdom valued at $11,000 -- as well as the title of the next GE Instagrapher. After the contest, GE then featured the top photos in a dedicated pinboard on its Pinterest account. We know, we know: This one wasn't originally a contest run on Pinterest. That being said, it's such a great example of how brands can integrate their social media presence across channels. GE leveraged multiple social networks to get the most reach for their campaign -- using Instagram as the entry point, Facebook as the evaluation mechanism, and wrapping it up with some extra visibility on Pinterest. (We bet they even promoted the campaign on Twitter, too.) Not only did GE do a great job of being lovable by promoting the awesome pictures from its followers through various channels, but it also promoted GE's presence on various social networks on different channels. Smart! HP hosts an ongoing Pinterest contest to promote its HP SpectreXT laptop. Depending on that particular week's theme, which participants can find on the contest's dedicated web page, entrants are tasked with creating a pinboard representing that week's theme -- which needs to include just one pin of the HP SpectreXT laptop -- and submitting the URL for their board through that web page (which requires a login). Public votes on submissions determine each week's winners, which are either rewarded with prizes including HP SpectreXT laptops and $500 Amazon gift cards. This contest is noteworthy for a number of reasons. First, it's an ongoing promotion that keeps changing, so HP continues to get value out of the contest over team while still staying fresh. Second, it's very unobtrusive. The theme featured in the above pinboard, "Anywhere Office," only has to feature one of HP's product, and the rest is dedicated to whatever the pinner would include in their "anywhere office." Couple this with the fact that the contest is ongoing and evolving, and over time, HP is rewarded with a lot of little product mentions all over Pinterest. Clever. The last thing we like about this is the fact that HP incorporates a landing page into the contest's equation, driving traffic to its website where it explains the contest rules and collects users' submissions and votes. And because login is required to submit -- and vote -- you know what else HP is also capturing? Contact information ... which ZHP can use to expand its marketing database. Well done, HP. Just keep in mind that requiring login can be a risky requirement for a contest, but for high-ticket prizes like laptops and cash, HP can likely get away with requiring registrations and logins without sacrificing a lot of engagement. 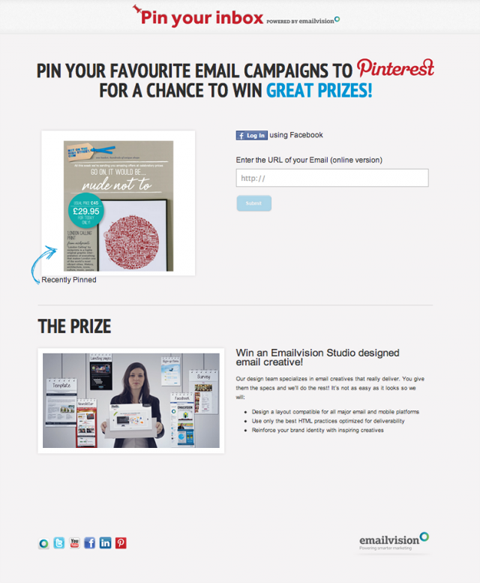 Brought to our attention by our friends over at Social Media Examiner, Emailvision's Pinterest contest was designed to get email marketers pinning about their own email campaigns. 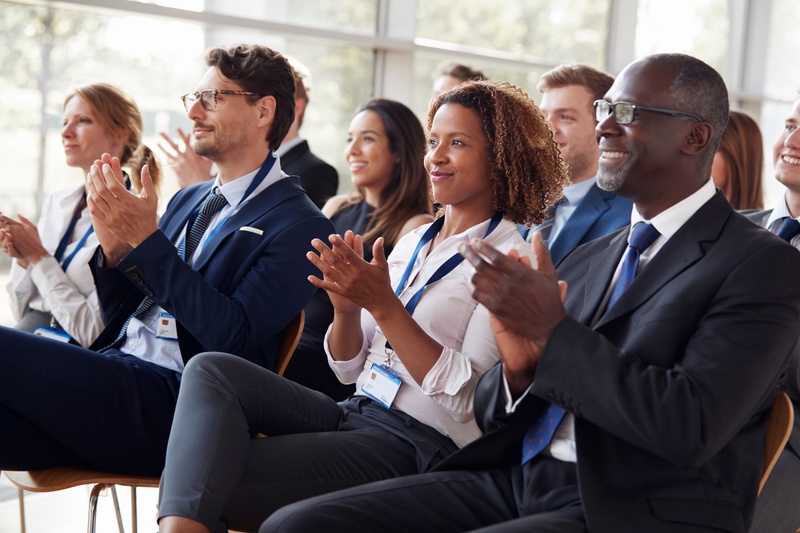 Participants were asked to pin their favorite email marketing creative and submit the URL to the online version of their email to a dedicated landing page. The Emailvision community and Pinterest users could then view and Like the showcased email campaigns, and the campaign with the most Likes was rewarded with Emailvision-designed email creative. Of course, we love the use of a landing page here, too, but our favorite thing about this particular Pinterest contest is its extreme relevancy. We love how well the contest catered to Emailvision's target audience -- email marketers! This ensured that Emailvision generated submissions from entrants who were qualified for their products and services. In addition, the prize is Emailvision's services, making it even more likely that the contest would only generate responses from those interested in email marketing. Another tip from Social Media Examiner, High Point Market's "Style Spotters" Pinterest contest also makes our list. The contest had an edge of exclusivity, as High Point Market, which organizes trade shows for the furniture industry, recruited top home fashion trendsetters to showcase their favorite products and top trends from High Point Market week. Designated participants would pin them to High Point Market pinboards and feature the exhibitor responsible for the item pinned. These "Style Spotters" also gave the exhibitors whose items they pinned a physical sign at the trade show that highlighted the Style Spotter’s name as well as a QR code and URL for the Pinterest board. 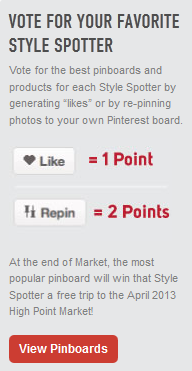 Event attendees then voted for the Style Spotters by Liking or repinning the pins, earning them various point values. The Style Spotter with the most popular pinboard won a trip to the next High Point Market event. While this particular Pinterest contest only involved a small number of designated entrants (the Style Spotters themselves), it got a lot of other individuals involved and did a great job of integrating an offline, traditional marketing event like a trade show with online channels like social media and interaction with the High Point Market website. Exhibitors benefited from being featured, and it was easy for trade show attendees and followers of the High Point Market Pinterest page to quickly identify some of the trendier products from High Point Market Week, and participate with a quick Like or repin. Now onto ModCloth's "Something ModCloth, Something You" Pinterest contest (because Pinterest is all about weddings and fashion, right?). Well ... no. That's not all it's good for, but there's no denying it's pretty perfect for those interests. So ModCloth jumped on it, launching a Pinterest contest inviting pinners to create a pinboard to inspire ModCloth's spring 2012 wedding campaign. 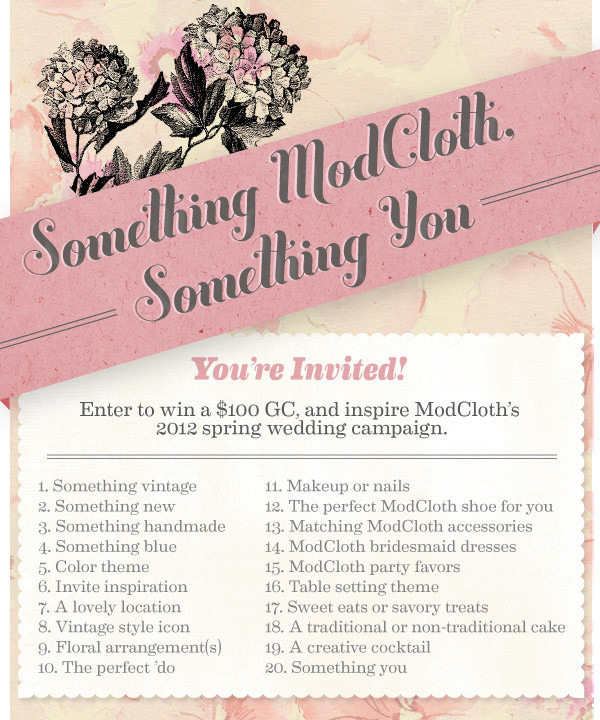 To be eligible to win a $100 ModCloth gift certificate -- and the inspiration for ModCloth's 2012 Spring Wedding Campaign -- entrants were required to create a pinboard called "Spring ModCloth Wedding," and pin one image to satisfy each of the following 20 criteria, tagged with the hashtags #modcloth and #wedding. To submit their board, participants were asked to leave a comment with a link to their board on ModCloth's contest announcement pin, appropriately located on ModCloth's wedding-themed pinboard, "To Have and to Hold." Boards were then judged on uniqueness, creativity, ModCloth spirit, and adherance to the contest guidelines. What single, dating, or engaged woman doesn't want an excuse to plan their wedding? To be honest, I'm married, and even I might have participated. This contest is not only fun, but it also taps into the behavior that ModCloth's target audience for this contest is already engaging in -- wedding planning! Another clever thing ModCloth did in this contest is require pinners to tag every pin with both #modcloth and #wedding. This ensures that entrants' pins show up in other users' wedding searches and are clearly branded, particularly beneficial since four items on each pinner's board have to specifically be ModCloth merchandise. The University of South Florida knows that your audience doesn't need to be in wedding planning mode to leverage the potential of contests on Pinterest. Its summer 2012 contest required pinners to create a USF-themed pinboard for the chance to win merchandise from the USF bookstore, plus the opportunity to become a contributing pinner for the official USF Pinterest page. Boards were required to include at least 25 pins -- 5 of which needed to be repins of images from the USF Pinterest page -- and boards needed to be submitted by email to the USF office of communications and marketing, which judged the entries on creativity, individuality, and demonstration of USF spirit. Not only did USF's contest successfully tap into the lifestyle of its audience, but it also gave pinners a whole lot of freedom in what they could pin, making the barrier to entry very low. There were no title requirements for participants' boards, and very few detailed guidelines to adhere to. This made it simple for students to spread their love for USF throughout Pinterest, reaching prospective students and touting collegiate pride. This one needs to be highlighted with one caveat. It was run as a sweepstakes, which is now against Pinterest's contest guidelines. That being said, the contest was held before Pinterest's official contest guidelines even existed, which we think gives the American Heart Association a 'get out of jail free' card, especially considering the rules of the contest were so clever. The "Walk it. Pin It. Win It" contest asked pinners to snap a photo of their favorite walking path, and pin it to their Pinterest account with the hashtag #walkit in its description. The American Heart Association will then find your pin and repin it to its "Walk It" pinboard, and entrants were eligible to win 1 of 5 prize packages -- an iPod shuffle and a $25 iTunes gift card. Talk about easy to enter contests! This contest didn't even require pinners to create a full-fledged, dedicated pinboard. In fact, pinners didn't even have to submit their pins in any way either, since the AHA smartly used hashtags as a way to identify participants' pins. We also love how the contest highlighted its entrants' creativity by repinning users' pins to its own Pinterest account. Just take warning -- Pinterest now advises against sweepstakes, and since the winner of AHA's contest was selected through a random drawing, it technically wouldn't fly had it been run that way today. To run a similar contest, just make sure you select your winners by judging pinners' creativity or putting it to a public vote via repins or likes by other Pinterest users. 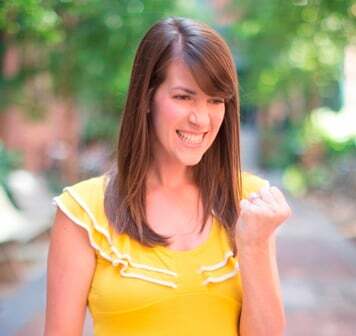 What other real-life examples of creative Pinterest contests have you run into? What made them work?